As Hilary Duff once said, money makes the world go 'round. Britney's been living the American Dream since she was 17. She's still gon' slip away to the Phillippines and we're still gon' put pictures of her derriere in the magazines. But we still want a piece of her. That's why Britney Spears: American Dream came to fruition in the first place. 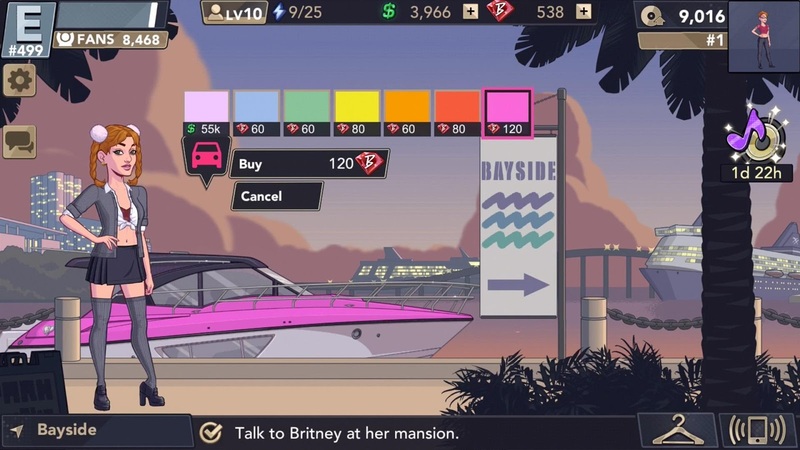 In the latest mobile game from Glu, just like in Katy Perry Pop and Kim Kardashian: Hollywood before it, money makes the world go 'round. Here's how to get more cash in your pocket and more rewards to keep things hopping. You'll need money to travel from place to place, purchase objects, and more, but you also need premium currency to buy objects and clothes that you love. This guide will be for finding all the freebies you can to maximize what you can get out of the game without having to resort to buying what you want with real money. And trust me, there's a lot you can get! West L.A.: Look for a squirrel by a tree. Check by the umbrella outside of Starbeans. There's also a sign outside that has a reward with it. Check Microbe Music for a bookshelf and La Estrella for a guitar that hides rewards as well. Beverly Hills: Check by Britney's mansion and a sign that's all the way left on the screen. Look all the way in the sky for a hot air balloon too. Check in Britney's mansion for an aquarium with a puffer fish inside as well as String for a wine bucket. Burbank: Look by the windsock, the speakers by the Sound Town door, and the ice cream cart. Look inside Sound Town by the stereo and go into Kihara to check the portrait too. The Loop: Check the street lamp and the stall next to the sign that says "Navy Pier." Inside Navy Pier: Look at the item in the background by the couple. The Strip: Check out the “Flamingo” banner in the background. There's also a "Paris" banner in the background. Checking out these locales and items should get you a bit of a headstart when it comes to finding items and materials needed to get ahead. Of course, cash and equipment isn't the only thing you can count on to become the world's greatest pop star. Check back for more tips and tricks coming soon!